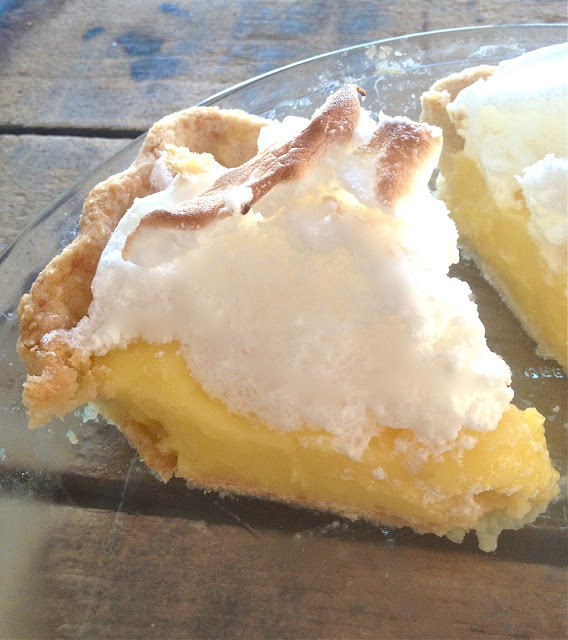 The Best Meringue Pie: Lemon-Marshmallow Meringue Pie! / Hey, EEP! 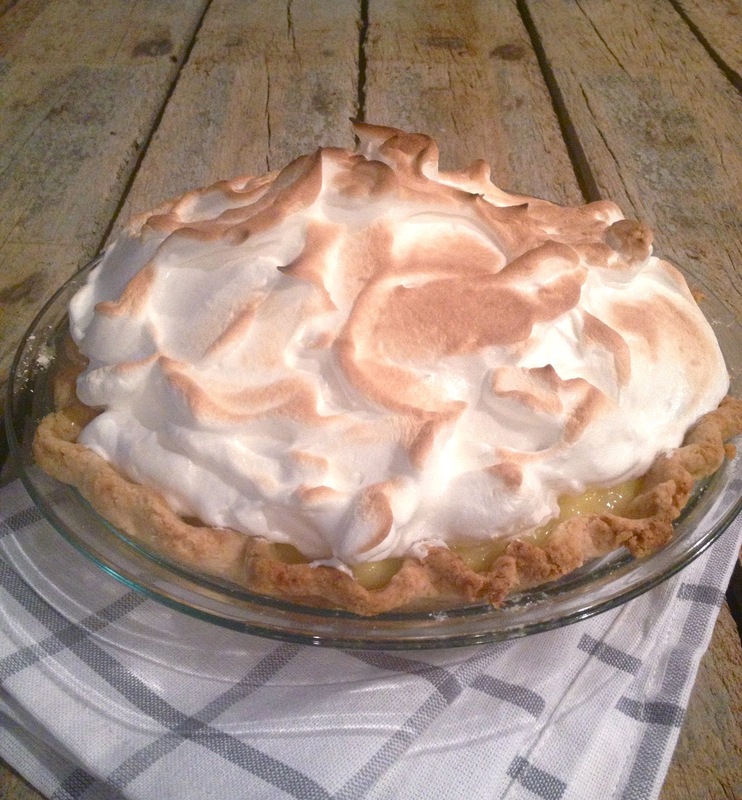 The Best Meringue Pie: Lemon-Marshmallow Meringue Pie! Lovely friends, there's only 1 week until Thanksgiving! Goodness did that sneak up. Continuing on with some non-traditional Thanksgiving pie options, I give you one of my absolute favorite desserts: lemon-marshmallow meringue pie. It's tart, sweet and fluffy—a nice break from all of the pumpkin, apple and nuts of the season! 1. Make the crust: Preheat the oven to 350˚. Pulse the flour, salt and sugar in a food processor until combined. Add the butter and pulse until the butter is in pea-sized bits. Pulse in the water, 1 tablespoon at a time, until the dough sticks together when pressed. Form the dough into 2 disk; wrap with plastic wrap and refrigerate at least 1 hour. 2. On a lightly floured surface, roll 1 disk out to a 13-inch circle (save the remaining disk for another use). Ease the dough into a 9-inch pie pan; trim the overhang to 1 inch, then fold the overhang under itself and crimp the edges. Pierce the crust all over with a fork; line with parchment paper and fill with pie weights or dried beans. Bake until golden, about 45 minutes. Let cool. 3. Make the filling: Whisk the egg yolks together in a heatproof bowl; set aside. Whisk the sugar, cornstarch and salt in a saucepan. Slowly whisk the water and milk into the sugar mixture until the cornstarch dissolves. Bring the milk mixture to a boil over medium, whisking constantly, then slowly whisk 1 cup into the egg yolks; pour back into the saucepan and cook, whisking, until thick, about 3 minutes. Remove from the heat. Stir in the lemon juice, lemon zest and butter. Transfer to a bowl and press plastic wrap directly on the surface to prevent a skin from forming. Refrigerate until cold, about 1 hour. 4. 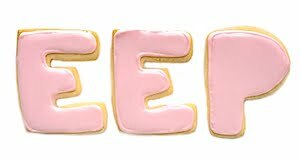 Make the marshmallow meringue: Beat the egg whites, marshmallow cream, sugar and salt in a stand mixer fitted with the whisk attachment until stiff peaks form, about 8 minutes. Beat in the vanilla. 5. Assemble the pie: Spread the cold lemon curd in the prepared piecrust. Top with the marshmallow meringue and make decorative peaks using the back of a spoon. Toast the meringue with a kitchen torch or broil briefly until golden (the meringue will brown quickly). Marshmallow Meringue... Brilliant! I am going to try this on my sweet potato pie..